The key is the quality of the liquid. The book’s greatest contribution to my cooking repertoire is fish stock, made from otherwise discarded fish carcasses, a waste not want not move that is satisfying in every way. 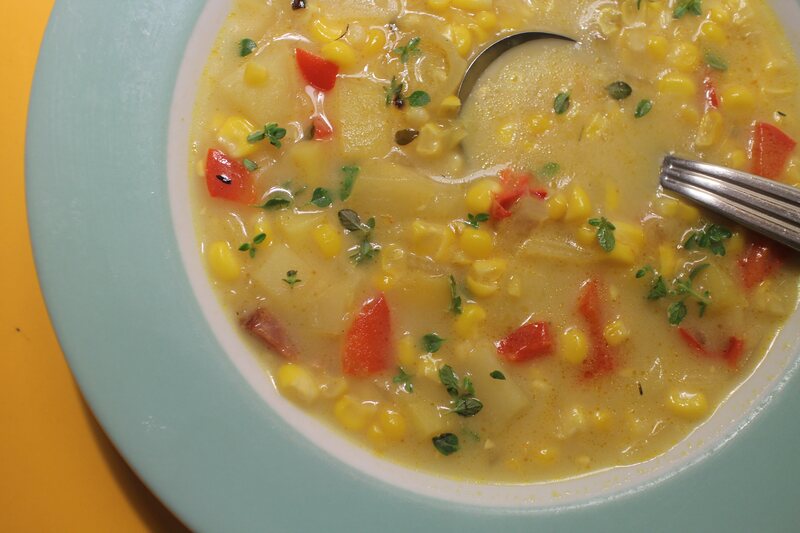 Here, after a picnic that featured corn salad and roasted corn on the cob, I cooked the leftover cobs and some of the roasted husks in water to make broth, and added the roasted corn kernels to the soup. 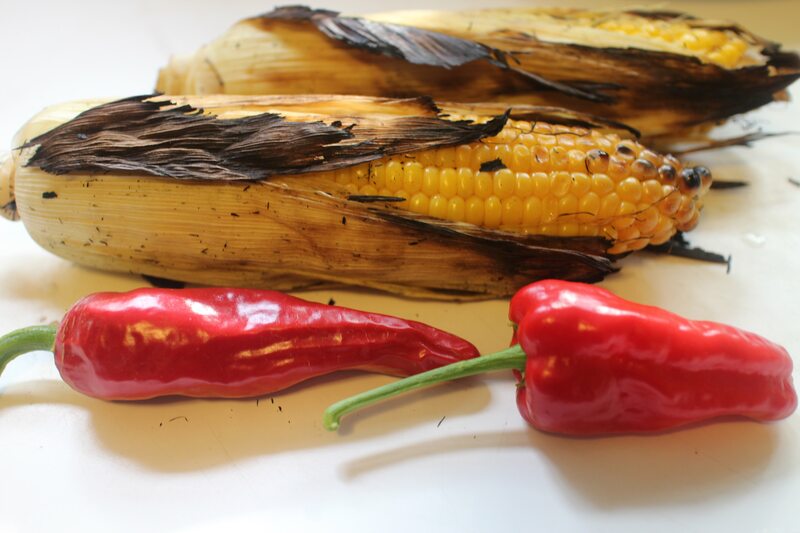 This coincided with the first harvest of red peppers from my garden, Aleppos and Chimayos and Pimentos and Padrons. The result was a richly flavored and slightly smoky chowder with a kick of hot peppers, perfect for the impending turn of the season. And I loved putting those leftovers to good use. Husk the corn and cut away the kernels, scraping down the cob to save the milky juice. Heat a large heavy pot over low heat and add the diced bacon, cooking it on low heat until it has rendered about 1 tablespoon of fat. Turn up the heat a little to allow the bacon to crisp. Add the butter, onion, bell pepper, thyme, cumin and turmeric and cook, stirring occasionally, until tender but not browned, about 8 minutes. Add the corn kernels, potatoes and liquid and turn up the heat. Cover the pot and allow the mixture to boil vigorously for about 8 minutes. Check for doneness and crush some of the potatoes against the side of the pot to thicken the chowder. The corn and potatoes should retain their shape, so don’t overcook them. Reduce the heat slightly and season with salt and pepper. Stir the cornstarch into 2 tbsp of water until smooth. Add gradually to the chowder and let cook for a few minutes, allowing the mixture to return to a boil. Turn the heat to low and add the cream. Do not allow the chowder to boil after adding the cream or it will curdle. Serve within an hour or let it cool and refrigerate it for another day. Adjust the seasonings if necessary and garnish with the scallions or chives. Makes about 7 cups, serving 3-4 for a main course, or 6-8 as a first course.